Guns can be beautiful, but they can also be downright ugly. And even though a gun may have historical significance in its original condition, ugly is ugly. If you can afford it of course, some old guns are good candidates for a complete makeover restoration, back to factory original. Restoring an old gun can be a big decision. 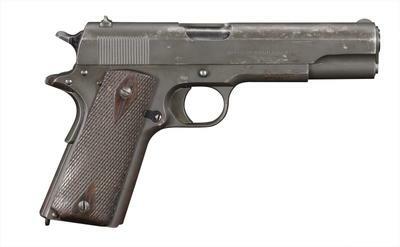 Original Colts, Winchesters, 1911s from various manufacturers, and double shotguns are worth big bucks even in rough condition, so not all guns are suitable for restoration from a value standpoint. But factory new condition is possible, even if a gun is horribly pitted and the parts are not all there. There is a tradeoff between “all original” value and refinished value in these guns, and that can get a little tricky. There isn’t a lot of collector demand for really rough guns under 45%, and these are great candidates for restoration. Turnbull Manufacturing has been the most recognized name in old firearm restorations since shortly after Doug Turnbull started out in 1983. 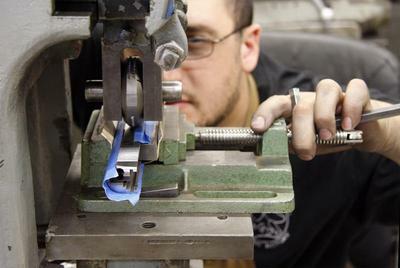 They employ nine full-time gunsmiths, plus an engraver, and work out of a 6400 square foot building in Bloomfield, New York. Overall, Turnbull has restored and/or repaired over 25,000 firearms, and now they even have their own line of guns There is no more respected name in firearm restoration worldwide than Doug Turnbull, and if you want your old gun restored to factory new, there is no company more capable and trusted than today’s Turnbull Manufacturing. You may not even know this, but guns were much prettier back in the day. From the factory, most pre-WWII guns, through the late 1930s, had what is called a “charcoal blue” finish on the barrel. It is a light blue, not the black you see today, and it glimmers and shines, unlike the black of today. The old guns also had “color case hardening,” on many of their bare metal parts, including the receivers on rifles and the frame on revolvers. Color case hardening is a multicolor design that is literally burned into the metal and shimmers with colors ranging from blues to greens, to purples to oranges, and no two guns are ever alike. Generally they also had reddish hand rubbed wood, really beautiful stuff. 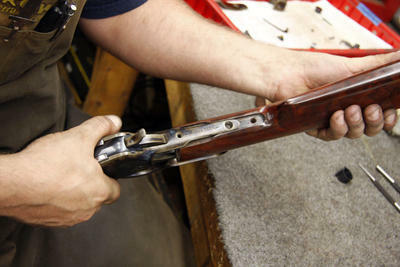 If your old gun is 45-50% or better condition, and hasn’t been cut down or had major parts or wood replaced, you should take a hard look at the all-original value before deciding to restore it, according to the experts at Turnbull. Guns in less than 45% condition can generally be refurbished back to factory new, and they will and retain in re-sale value that money that you spend with Turnbull Manufacturing (and sometimes multiply several times). Better condition guns are always in demand by collectors and investors, but the rougher the gun, the fewer people want it. The Turnbull crew can give you a good idea in real dollars of what the effect of a high quality restoration will have on the overall resale value of the firearm, original versus refurbished. They have a 12 month wait on restorations, so they aren’t hurting for work, and you can trust their opinion as to what is best for your gun. Doug and the guys themselves buy guns to restore and sell at a profit, because though nobody wants an old grey ugly gun, everyone wants a Turnbull, if you’re a gun nut of course. 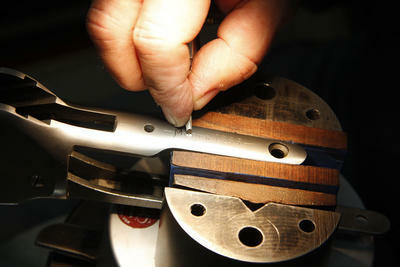 Accuracy is often even more important than beauty in an historic firearm restoration. Parker Shotguns, for instance, are known for muted colors in their case color hardening, whereas WInchester and Colt produced guns with purple and even orange highlighting. You may have heard of charcoal bluing if you are a gun nut, but did you know that the screws, trigger, basepin and some other small parts were what is called Nitre Blued in the late 19th and early 20th century? Colt, Winchester, Marlin, and many other gunmakers used this purplish, or what is sometimes called “fire bluing” on the small parts only, because it is more durable than charcoal blue. By the second world war, the black bluing we see on guns today, which is called hot, or “dulight” bluing, became the standard because it was cheaper, but prior to this most guns were charcoal blued with Nitre bluing on the wear parts. 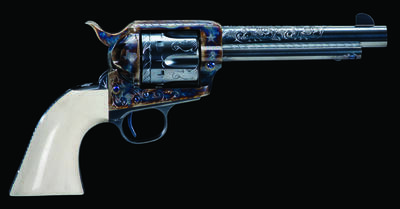 Case color hardening was used on Colt frames and Winchester receivers during the entire cowboy era, as well as on many other guns, like the Sharps, Winchester Hi-Wall, and the Remington Rolling Block. Most side by side shotguns also had charcoal bluing and case coloring. Bone charcoal is the key ingredient in this unique process that Turnbull has perfected over the years. The gun is packed in it and heated in an oven, and the longer you leave it, the richer the highlights. 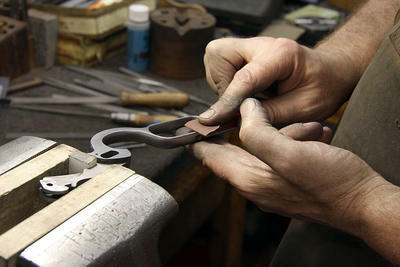 It also hardens the steel to a 28-35 Rockwell, and the finish can’t scratch off. It is 15-20 thousandths deep into the metal. Turnbull can bring all of these guns and more back to factory new condition, with, in most cases the original correct markings re-rolled into the metal, clean and sharp. Over the years they have accumulated a number of original dies from the original manufacturers, and it is almost scary just how “original” they can make a beat up old gun look. They will not, however, take an Italian or other replica gun and sand off the old markings to replace them with period correct markings. This would lead to a very confusing situation with possible Turnbull guns being sold as original guns, and there are also copyright issues even if they wanted to do such a thing. The guns that Turnbull Manufacturing now makes are made from purchased parts, in the white with no finish, and Turnbull works their magic on them to make them truly exceptional pieces of art. The lever gun receivers are custom CNC machined from one, consistent supplier, and the single action revolver frames come from U. S. Firearms, who make their own version of the famous Colt that is known for great quality. Turnbull does not do action jobs though, so if you want a gun that is both beautiful and competitive, you will have to also send it out to an action specialist. Just remember that rust solvents also remove traditional bluing, because it is in fact rust, so for working guns you need to be careful not to ruin them with the wrong chemical. Also keep in mind if you plan to cowboy shoot with these guns that sunlight, and UV rays, are about the only thing that damages case coloring, and it is tough to stay out of the sun cowboy shooting. The costs involved with a Turnbull restoration may require a specific quote. They do have a price list on their website, but those are exact prices for disassembled, cleaned and polished parts. On an old grey Colt single action that has all working parts and doesn’t need anything, a typical simple bluing and case coloring, as well as grips will run you about $2,500. A working yet ugly Winchester levergun with the metal done, as well as the stock, is about $3,000. Replica guns, brand new from Uberti and others, that you want to transform to the original factory look run about $650, and leverguns about $1300. 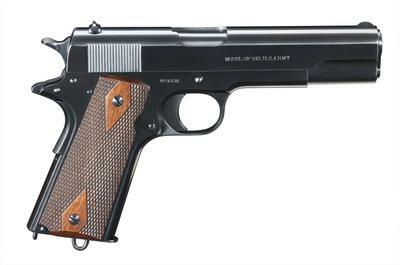 And though the 1911 was never issued with a case colored frame, the Turnbull 1911 re-furb, to case color the frame and charcoal blue the rest of the parts, very pretty, is $650. If you have a field grade L.C. 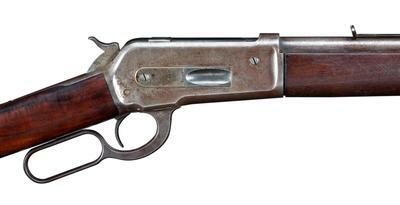 Smith, Parker, Fox or other old shotgun, complete restorations are in the $3,000 range. The in-house engraver has an interesting variety of functions at Turnbull. They get in a lot of old higher grade shotguns, like a Parker DHE, and many of them are in terrible shape, pitted and worn from years of neglect. In these cases, where some of the guns need to be sanded a great deal to get out the pitting, their engraver can exactly replicate the engraving that was on the gun. They also have a bunch of original patterns from Colt, Winchester, Marlin and others of the factory engraving on higher grade guns. So you can upgrade your gun as part of the restoration. Custom patterns are available as well. And engraving, historically, is also something that almost always stays in the value of the gun and often multiplies in value. Not a ton of engraved guns exist in the world, and there will always be a good market for them from collectors and shooters alike. Instant gratification is possible at Turnbull, but not with restorations, which do have that 12 month wait generally (notice that we repeated this 3 times so don’t complain in the comments when you call and are told this). They currently have some of their Ruger #1 Rifles in their own proprietary .475 Turnbull caliber. They are roughly $2,000, and are absolute things of beauty. The Ruger #1 didn’t exist in the late 1800s, so they were never a true buffalo rifle, or the first generation of African rifles, but since Ruger introduced their much loved falling block in 1967 it became an instant classic, and a favorite of American, African, and European hunters alike. The Turnbull #1 is made specifically for them by Ruger in .475 Turnbull, and the base cost is $1,100. Refinished with rich color case hardening and charcoal blue brings them up to $2,000. Both Hornady and RCBS make dies to reload the straight-walled Turnbull brass (probably made for them by Starline so good stuff), and they sell the unprimed brass for $175 per 100, very reasonable. Grizzly and Corbon both make loaded ammo for the gun. For bullets, Barnes makes a solid hardened copper and zinc solid for dangerous game, and a solid copper hollowpoint TSX for extreme expansion that was designed specifically for the .475 Turnbull. I found a lead bullet supplier, with gas checks and without for $30 per 100 at Montana Bullet Works, and they appear to get the gas check mold from Lead Bullet Technology (LBT). I also found a less expensive two cavity with several drive band options with no gas check at Mountain Molds. And wouldn’t you know it, there is actually a 325 grain gas check double cavity available from Lee for twenty bucks on Midway USA. They also have the gas checks available, and they have some pre-cast bullets with gas checks for sale as well. You would need the gas check for full snot loads in this powerhouse caliber, but I think that if you want to invest in one gun for a variety of purposes, this caliber could be downloaded to much less with wheel weight bullets for whitetails. We hope to get one of these Turnbull Ruger #1s in down the road to be able to get to actually shoot one. From an investment perspective this gun is a steal. The Ruger #1 comes in and out of production and they almost always increase in value in the odd calibers. The Turnbull #1 is the kind of gun where someone just said, “this would be kinda neat,” and they actually followed through and made a bunch. Like all specialty guns, they WILL dry up, and when that happens I predict you will have to pay twice as much for one overnight, used. I’d love to see Turnbull take this caliber to some of the classic external hammer single shots, like the Sharps, Highwall and Rolling Block, but only the latter could probably handle the pressure. Getting this gun in and shooting it will be exciting. Nobody doesn’t like a #1. Restoring an old gun is a tough decision, but it truly becomes a legacy and family heirloom that you create yourself. And though Turnbull doesn’t encourage people to send a $100 gun in for a $2,000 restoration, to bring it back to factory new, plenty, and I mean plenty of people send them old hardware store double shotguns, .22 plinkers, and beat up old break tops to restore for children and grandchildren, A utility gun won’t retain the money you put in, but you will be passing along a family heirloom in the same condition it was originally purchased. What is the price of a legacy after all? 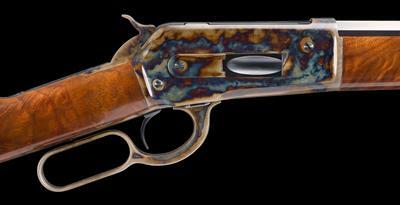 Classic Colts, Winchesters, Marlins and even double action pre-war Smith & Wessons and L.C. Smith or Parker shotguns will almost certainly retain the investment made in them with a Turnbull restoration, and the transformations you can see here in the pictures. Your old grey gun that your great grandfather brought home from the war, a gun you feel responsible not to get rid of, will turn into a gun you love to own, and that you will be proud to pass on to your heirs. Few things in life are a no brainer, but restoring an old grey and only marginally collectible gun with Turnbull is a no brainer. That is probably why they are backed up a year.